The New York Mets stopped being the laughingstocks of baseball and became unlikely World Series champions on the afternoon of October 16, 1969. After the Mets joined the National League in 1962, they spent most of the decade known as a bunch of lovable losers. All that ended on a pleasant fall afternoon with temperatures in the mid-60s that made for a perfect day for a baseball game.1 By the end of the day, New York was celebrating an incredible end to its fairy-tale season. 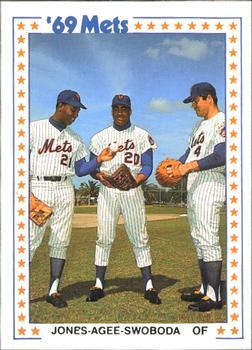 Hodges chose Koosman to pitch the fifth game. Koosman had earned a 2-1 victory in Game Two, pitching 8⅔ innings and holding the hard-hitting Orioles to just two hits. Now he was given the opportunity to clinch the championship in front of a home crowd. For the Orioles, Dave McNally, the losing pitcher in Koosman’s victory, was the starter. Koosman held the Orioles to one hit in the first two innings, a single by second baseman Davey Johnson in the second, but gave up three runs in the third. Mark Belanger singled to right field, then Koosman gave up a home run to McNally. Koosman got Don Buford to ground out to shortstop and struck out Paul Blair. But the next batter, Frank Robinson, hit another home run, a blast over the center-field wall, to give the Orioles a three-run lead before Koosman struck out Boog Powell to end the inning. Meanwhile, Dave McNally was dominant, holding the Mets to three hits through the first five innings and striking out five. It looked as if the Orioles might bring the Series back to Baltimore. But things began to unravel for them in the bottom of the sixth inning. After the two home runs in the third inning, Koosman had allowed just one hit over the next six innings, a single by Boog Powell in the top of the sixth. Another unusual call went against the Orioles in the top of the sixth. It appeared that Koosman hit Frank Robinson but DiMuro ruled against the Orioles again and Robinson ended up striking out. After Curt Motton pinch hit for McNally in the top of the eight, Eddie Watt took over on the mound. Jones led off the inning with a double. After Clendenon grounded out to the third baseman, Ron Swoboda doubled to left and Jones scored. Ed Charles flied to left. The next batter, catcher Jerry Grote, hit a groundball down the first-base line. Powell bobbled the ball and then threw it late to Watt, who let the ball get away from him. Both players were charged with errors on the play, which allowed Swoboda to score. Grote was safe at first.7 Weis ended the inning by striking out. Koosman walked Frank Robinson to start the ninth inning but the rest of the Orioles batting order was unable to get a rally started. Powell grounded to shortstop Weis and Robinson was forced at second. Brooks Robinson hit a fly ball to Tommie Agee in center field, and Davey Johnson’s fly ball to Jones in left field ended the game. Jones later said that he was thinking, “Come on down, baby, come on down. It’s all over” as he waited for the ball.8Koosman went the distance for the win as the Mets surprised the baseball world by winning the World Series. In addition to the sources cited in the Notes, Baseball-Reference.com, Baseball-Almanac.com, and Retrosheet.org websites were used for box score, player, team, and season pages, pitching and batting game logs, and other pertinent material. 2 “1969 The Amazin’ Mets,” ThisGreatGame.com, accessed November 2, 2016. 3Ken Belson, “Mets Interrupt Gloom to Recall 1969 Glory,” New York Times, August 22, 2009. 4 Phil Pepe, “Mets Refuse to Quit, Rally to Beat the Baltimore Orioles 5-3 in Game 5 at Shea Stadium to Win 1969 World Series,” New York Daily News, October 17, 1969. 5 Clayton Collier, “Frank Robinson Still Swears Miracle Mets Scuffed Ball In Game 5 Of 1969 World Series,” Mets Merized Online, June 14, 2013. 6 Ed Leyro, “One Mo-MET In Time: Al Weis,” Studious Metsimus.com, accessed November 1, 2009. 7 Phil Pepe, “Mets Refuse to Quit. 8 Tommy Hicks, “Amazing Memory: Mobile's Cleon Jones Recalls Catching Final Out in 1969 World Series,” AL.com, November 7, 2009. 9Jesse Goldberg-Strassler, “Memories of a New York Mets World Series,” Ballpark Digest, October 30, 2015.